What world do you want to live in? #TheWorldWeWant is a global movement that invites you to share your vision for yourself and the world. 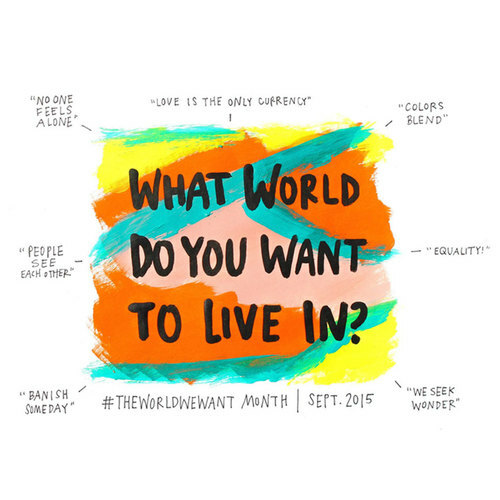 This September 2015, hundreds of walls are going live across the globe for "World We Want Month." The project was created by Amber Rae (@heyamberrae) and is brought to you by local Makers. What world do you want to live in? And what are you going to do to make it happen? This is the key question that Amber Rae , american entrepreneur and writer was asking herself at this time last year . I discovered Amber's blog by complete chance, I think I was reading an article about a list of women bringing change in their communities. I completely fell in love with her blog and her story, Amber was working succesfully in technology in the Silicon Valley, when she felt that something was missing in her life and from one day to another she sold everything she owned and moved to New York to discover what was her life purpose. She had nothing planned in NY and what she started to do was just experimenting ( as you can guess from the title of this blog , I LOVE this word and bold people) with her life and new amazing opportunities came along her way. The rest is history! The world we want is one of her most successful projects and the fun part is that you can get directly involved! The idea developed into a bigger project involving hundreds of people around the world , she created a global movement where once a year , in September, change makers from different cities of the world were building a wall where they were asking people to participate and write down which world they dreamed to live in. And this September 2015 the project is coming to PARIS for the first time!!! So what are you waiting for? Get involved and join me and other inspiring change makers in this adventure! Please contact me by email at gandolfoalessia@gmail.com if interested , let's make it happen !